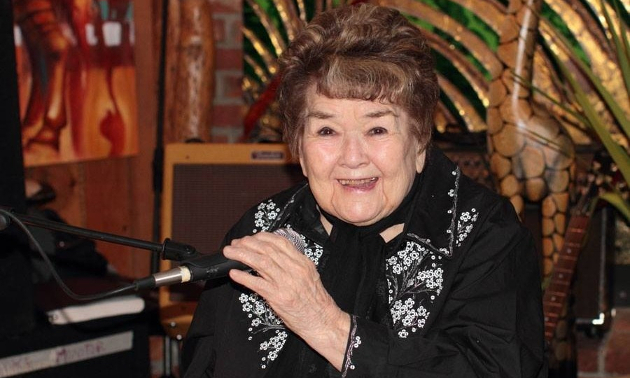 Legendary and pioneering guitar player, country music star, label owner and businesswoman Bonnie Guitar has passed away according to close friends and family. She died Sunday morning (1-13) in Washington State, where she was born, lived most of her life, and launched a record label that had major implications in American music, leaving a legacy that spans from country music hits, to iconic contributions to studio recordings, to discovering bands as a businesswoman. She was 95-years-old. Bonnie Guitar is best known for her big hit “Dark Moon” written by Ned Miller, and released as a single in 1957 via Dot Records. The song did well in Bonnie’s native genre of country, peaking at #14 on the Billboard Hot Country Songs chart. But it also became an unexpected crossover smash, surging all the way to #6 on the Billboard Hot 100, and putting Bonnie Guitar on the national map. Bonnie Buckingham was born on March 25th in Seattle Washington, and grew up in the Puget Sound area on a farm in a family with five other siblings, later moving to the rural town of Auburn. She began playing guitar at 12, first learning from her older brothers, and began performing as a guitar player at the age of 16, earning the name Bonnie Guitar for her unusual skill and adeptness at the instrument in an era when guitar playing was dominated by men. She married famous guitar teacher and musical instrument inventor Paul Tutmarc in 1944, but after splitting up, headed to Los Angeles area (Malibu) where she started doing studio session work for Fabor Records. This is where she fell in with singers such as Jim Reeves and Ned Miller, and started to build aspirations as a performer herself. After first recording “Dark Moon” for Fabor Records in 1956, the song was subsequently re-issued by Dot Records in Nashville in the spring of 1957, and it quickly became a surprising hit both in country and pop. This made Bonnie Guitar a pioneer in country, giving her one of the genre’s first crossover hits from a woman behind Patsy Cline’s “Walking After Midnight” issued in 1956. Bonnie’s followup “Mister Fire Eyes” also written by Ned Miller did well in country too, cresting the charts at #15. However when the song failed to cross over, Dot failed to extend Bonnie’s contract. From there, Bonnie Guitar’s career took an interesting turn, once again making her a unique character as a woman in a man’s world. Back in Seattle, she started her own record label, initially called Dolphin Record, then changed to Dolton Record with Bob Reisdorff. The label would play a pivotal role in popularizing West Coast do-wop, surf music, and pre-punk riffs. In 1959, Bonnie Guitar signed the high school trio The Fleetwoods to Dolton Records, which had multiple hits, including the well-recognized No. 1’s “Come Softly to Me” and “Mr. Blue.” Then she signed the legendary instrumental surf guitar band The Ventures, which is credited as being one of the most influential bands in American music history. But Bonnie Guitar wasn’t done being a performer just yet. After taking a few years off to record a concept record about the arc of a romantic relationship that was shelved and never widely released, she began recording for Dot again, earning Bonnie her best charting success in country of her career. From 1965 to 1969, she was able to amass five Top 20 hits, including 1965’s “I’m Living In Two Worlds,” and her biggest country hit, “A Woman In Love” written by Charles Anderson, which peaked at #4 in the charts. She continued to record for Columbia and RCA Records throughout the 70’s even though the hit songs began to slow. Over the years, Bonnie also worked as a cattle rancher, and with quarter horses. Yet over the years, Bonnie Guitar proved to be a musical lifer, settling in the small town of Soap Lake, Washington on the other side of the Cascade Mountains from Seattle, and for years playing every Saturday night at the Businessman’s Club in town, even as old age made it hard for her to walk or play guitar. In December, a GO FUND ME page was set up for Bonnie, who was suffering from congestive heart failure. When you’ve worked as a session guitarist as a woman in the 50’s, had multiple country hits, owned a record label and discovered important bands such as The Ventures, you can say you had a rich and influential life. Bonnie Guitar contributed her more than her fair share to American music, and can truly rest in peace. country music division in the late 60’s? She was a talent coordinator and producer for Dot. I know she produced some of those Mac Wiseman records, and scouted for talent in the Pacific Northwest. Not sure if at any point she headed the label, but I wouldn’t be surprised if she did. Love learning about these people. Hate that their passing is what’s prompting the lessons. Wish I could have seen Auburn back when it was rural. It’s just another suburb in the Seattle-Tacoma metropolis now. I’m kind of amazed at how much influence has come out of the Seattle area over the years, though the natural wonders are indeed creatively inspiring. In addition to her solo recordings Bonnie released a duet single with producer/publisher/songwriter Buddy Killen. Billed as Bonnie & Buddy. “A Truer Love You’ll Never Find (Than Mine)” was released on Paramount and peaked at #55 in the summer of 1969. Bonnie did West Coast A&R for Dot and ABC Paramount Records. She said she was offered an executive job at a Nashville record label but declined. In an interview she admitted that her singing career suffered because she was not as interested in performing as doing behind the scenes studio work including playing guitar, engineering and producing. I just love Bonnie’s song “If You’ll Be the Teacher” which should have been a smash hit on both the country and pop charts like “Dark Moon”. RIP Bonnie. I’ll admit I didn’t know anything about her before this article. What an interesting person she must have been. These kinds of articles might not get the most reads or comments, but they are an important part of what you do here. i am 82 years, had many of the LPS by Ms Guitar, loved her voice. Do wish her early ones would be released on cd. One of the best was Night Train to Memphis.